Alex graduated from the University of Sydney in 2004 with an interest in equine practice. She completed a 1-year equine internship at Agnes Banks Equine Clinic, NSW Australia, before staying on as an ambulatory veterinarian. She subsequently undertook 6 years of imaging training at the University of California, Davis; 2 years training in Large Animal Ultrasound with some of the world's top Equine Ultrasonographers, followed by 4 years training to be a specialist veterinary radiologist. Alex became a Diplomate of the American College of Veterinary Radiology in 2013 and returned to Australia to work at the University of Sydney as a Senior Lecturer in Veterinary Diagnostic Imaging in 2014. 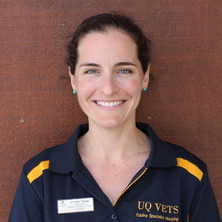 Alex joins the growing UQ Veterinary Diagnostic Imaging team and will be working closely with our Equine Specialists and referring veterinarians to provide the highest quality of imaging possible for our equine patients. She has a strong interest in the diagnosis, monitoring and rehabilitation of musculoskeletal injuries as well as the use of advanced imaging modalities to help us obtain an accurate diagnosis in more challenging cases. Alex's research interest focus predominantly on the musculoskeletal injuries of sport and performance horses. She has a research interest in the use of advanced imaging modalities to facilitate the identification of prodromal osseous changes in racing thoroughbreds and the potential to identify individuals with a greater risk of catstrophic injury.